Preserve the Past. Illuminate the Present. Shape the Future. Sparked by the release of a new book on the creation of ethnic studies by Martha Biondi entitled The Black Revolution on Campus, narratives of struggle for ethnic studies have once again found their way into the mainstream and academic press. Ethnic Studies is an intellectual challenge to traditional disciplines such as Anthropology, History, English amongst others that are constructed and inherently promote Eurocentric perspectives, intellectual traditions and frameworks, often ignoring and marginalizing peoples of color. Ethnic Studies teaches the stories, histories, struggles and accomplishments of peoples of color in their own voices. Struggles for ethnic studies were fueled by Black Power, international anti-imperialist solidarity and militant calls for culturally relevant education in the late 1960s. 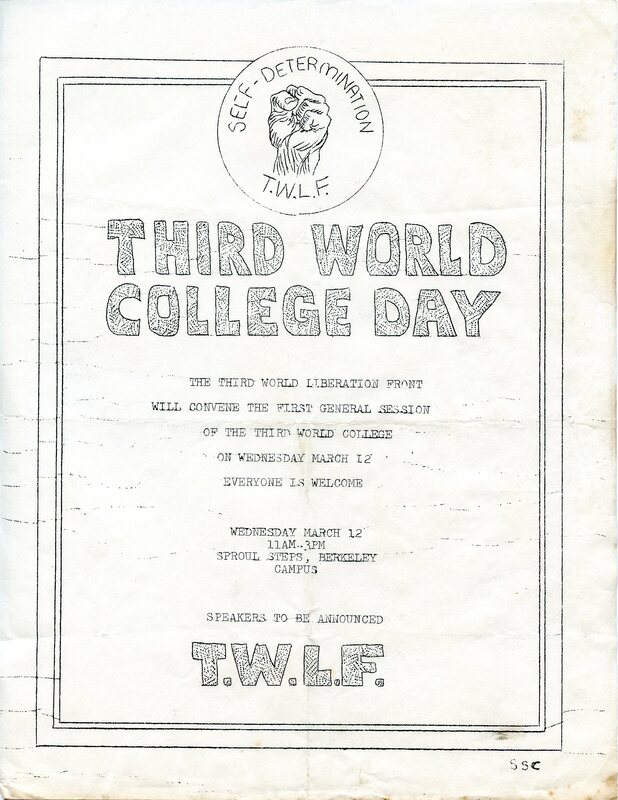 In 1968, a student led coalition of ethnic organizations united as the Third World Liberation Front (TWLF) and initiated a student strike at San Francisco State University (SFSU). A couple of months later, students at the University of Berkeley, united under their own Third World Liberation Front, organized a student strike at Berkeley. Despite violent police repression and administrative resistance to engaging student demands, prolonged student strikes, dedicated organizing and large protests forced the administrations at both SFSU and Berkeley to meet student demands and by March 1969, both universities had Schools of Ethnic Studies. This Friday, October 19, 2012, SFSU will hold their 11th Annual Ethnic Studies Conference whose major goal is to promote and introduce high school students to ethnic studies and provide the space for consciousness raising and alliance building amongst students. The Freedom Archives will be presenting a workshop at the conference on entitled The Struggle Against Mass Incarceration: Prison Resistance from Attica to Pelican Bay. We will show our documentaries on George Jackson and the Attica Prison Rebellion and then discuss why George Jackson and Attica matter in our lives, current strategies of prison resistance being utilized around the country and the importance and potential of ethnic studies to sustaining prison resistance. We look forward to engaging youth about these issues and participating in a space commemorating the struggle to decolonize the nations’ universities. This entry was posted in Freedom Archives Events and Trips, From the Archives..., Youth and tagged Attica Rebellion, Ethnic Studies, George Jackson, outreach, Prison Industrial Complex, Third World Liberation Front, youth. Bookmark the permalink.